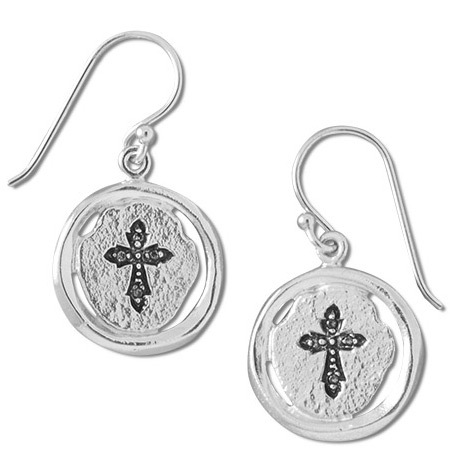 French-wire stamped Christian disc earrings with oxidized cross in the center. The crosses are embellished with small CZ stones (cubic zirconia) crafted in .925 sterling silver. Each silver disc measures 15mm in size (just over 1/2", at approx. 0.59 inches) and the earrings hang at approx. 29mm (1.14"). These are beautifully unique earrings that are truly one-of-a-kind. A matching Christisn cross disc necklace is also available (shown below). These earrings are also a great conversation started and a way to share your faith. Every jewelry item from Apples of Gold comes with free shipping within the U.S. and international shipping is available to those outside. Our cross disc earrings also come with our guaranteed 45-day money back return policy. We guarantee our French-Wire Stamped Christian Cross Disc Earrings, Sterling Silver to be high quality, authentic jewelry, as described above.